There's a new TV show in town, written by Louis C.K. 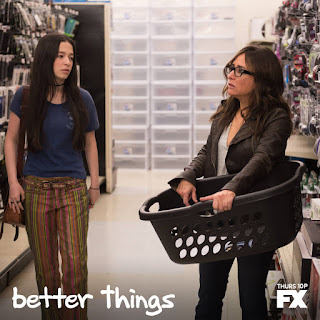 and Pamela Adlon and stars Adlon as “Sam Fox” - a working single [actor] mom, trying to raise her kids in a world not quite as filtered as some other T.V show's might like us to believe in! With real-life-like situations, comedic thrills and life's ups and downs thrown all around, Better Things is right up my alley and almost feels like my life put on screen if I weren't married, and if I actually acted for a living! There is something so great about comedy that comes from real-life and Better Things is semi-autobiographical in that it reflects some of the real-life of Pamela Adlon and hits home with me as I have zero filter and call things like they are, too. I've always adored Louis C.K. and loved all of his family-related skits and I am sure [with him on board] that this show is going to be a big success. His matter-of-fact, dry and reality-based situational humor gets me every single time and I can't wait to see what he and Adlon bring to the table here as the series progresses! Sound familiar? It does to me! I'm often saying that I should write a T.V. show based on the ridiculous situations that come with every-day family goings-on, because there are MANY that happen, and many we laugh about in private, but to see a reflection of real life parenting and its struggles [that we all identify with if we're honest with ourselves] is just exhilarating. There is much power in identifying with a character, and I've definitely been there, which I'm sure you have at some point, too. Better Things is going to have us all nodding our head and laughing in agreement. One lucky winner will win it all and ALL you have to do to enter is LEAVE A BLOG COMMENT [below] - You could tell me some of your funniest parenting moments or how you cope with mom-stress, a tip for keeping life in check or the best piece of mom wisdom you know! You could even tell me a little something about Better Things that makes you want to tune in, it really is up to you! What are you waiting for!? Rules: Giveaway ends 9/29/16. Entrants must reside in the U.S., be 18 years of age or have parents permission if younger, must leave a valid email address (or twitter handle so I can find you) and leave a genuine, thoughtful comment! Entries will be counted from Facebook, Blogger and Instagram and chosen by number via random.org and contacted within 24 hours of selection. The winner will then have 1 week to claim their prize before the prize is re-drawn and a new winner chosen. Note: Your email and/or personal details are not used by Mom's Gone Bronson for anything other than to contact you should you win this prize, please enter with confidence! If you have any questions, please get in touch, thank you! @Reviewzblog I saw this chick on Kimmel. She is hilarious and really made me want to watch the show. I love Louis C.K. & this show sounds really interesting! I just might have to check it out. Thanks! I think you're going to really like it! I am already hooked! This look really interesting and I like that is seems to share life the way it really happens. Real life is not always pretty ! I'm not a mom, but I was raised by a single mom. She was a mom, dad, cook, best friend, police, and everything in between rolled into one. I hope Better Things will also be shown here in my country. That looks like a great show! I've heard of it but not seen it. I'll be dvr'ing it now! thanks and thanks for a giveaway! What an awesome giveaway! I deal with mom-stress by making sure I get some quiet time to myself in the evenings after the kiddos are in bed. This sounds like it will be super good and funny of course! Can't wait to check it out. Such a great giveaway! It looks like interesting and funny. I can't wait to see this new show. Every single mother out there will be able to relate to her. The best advice I have for any mother out there is to make sure to have a few minutes a day for yourself. We all tend to take care of everyone else and not ourselves. Thanks for sharing the information and the giveaway. I will definitely have to check our Better things. I am also a filterless mom who calls things as I see them. I also love Lois Ck's humor. I had not heard about this show!! I am going to have to watch it, I love a good comedy! This show sounds promising. I definitely like Louis CK's writing so I'll have to tune in! My tip for handling Mom Stress is to take a little time for yourself everyday, even if it's 15 minutes. I usually get up earlier then everyone in the house and have my coffee. I cope with mom stress by having an amazing husband who shares in all the ups and downs with me. That show sounds SO funny. I agree LCK is one of the funniest comics out there, so he is going to rip this show! Omg this show looks like it's going to be a total goodie!!! I cannot wait to give it a watch and see it for myself! The best piece of mom advice I know is always be yourself no matter what. Do not let other people change you into who they want you to be. I like that it deals with issues moms deal with. I like the pillow clip. My mom advice is simple but true...live life everyday and appreciate your loved ones. Unfortunately my husband and I have lost both our parents ( way to soon) and it makes me realize that life is short and don't stress the small things. It's easier said then done but I try. Great prize, thanks. I cant imagine raising 3 girls alone. I relate to her being a single mom. I watched the First Look clip and enjoyed getting the main character's perspective on it. Oooh this looks really good and I'm gonna check it out. Zero filter, tell it like it is. Yep that's me, lol! I love being a mom but I totally realate to this show and what she goes through. From teenage mood swings to toddler tantrums, I've dealt with it all. Can't wait to watch, looks like a great show! Sometimes when you think you are having a bad day, all you have to do is check out someone else's day. I've got a neurotic cat, needy husband and almost 15 yr old suffering from PMS on a daily basis... so there are times I just need to de-stress and watch shows like this to realize that I'm not the only one! I will have to check it out, haven't heard of this show before. I like that the show is relatable. The pillow scene is great. I have not seen this show but it sounds like it would be great. As a single parent of 3 boys I know how tough and funny and of course embarrassing it can be. My funniest embarrassing moment was when I took my kids to the laundry mat I had a skirt on my son runs over and lifts it up and points saying I see your underpants. ( Mind you the laundry mat was packed) And everyone was looking . I haven't seen it, but I want to. I want to see how a single mom handles raising 3 kids and working. I don't have any kids but my sister does, she has 3 & our mom helps her with them because she wouldn't be able to on her own. My tip for keeping life in check is to simply be and maybe an occasional nap. This show looks fantastic and relatable! My tip for keeping my sanity is to not take myself too seriously. I try to find the humor in all the crazy things that happen to me and my three kids.